The teaching materials for the learning experience on “The Godhead” are divided into two parts. In part 1, students will study paragraphs 1.1 through 1.7 of this doctrinal topic using the information in the Doctrinal Mastery Core Document. They will learn that the Father, the Son, and the Holy Ghost are three separate beings and that Jesus Christ will come again in power and glory and will reign on the earth during the Millennium. Students will also study Doctrine and Covenants 130:22–23 and 29:10–11. Note: You could teach the four segments of this lesson in a single class session or over the course of several class sessions. If you choose to teach the segments over the course of several class sessions, you may need to briefly review with students what they learned in previous segments before you teach a new segment. Divide students into groups of three or four. Provide a piece of paper for each group, or invite them to use their class notebooks or study journals. Ask each group to write down as many truths about the Godhead as they can think of in 90 seconds. Following this activity, ask students to turn to doctrinal topic 1, “The Godhead,” in the Doctrinal Mastery Core Document. Invite them to take turns reading paragraphs 1.1–1.7 aloud in their small groups, looking for truths about the Godhead. After allowing sufficient time, invite the groups to report what they found. Do any of the truths about the Godhead that you found in these paragraphs support or confirm any of the truths you wrote on your paper? If so, which ones? What additional truths about the Godhead from these paragraphs stood out to you? What truths about the Godhead do you think are especially important for people to understand? Invite a student to read aloud the first two sentences of paragraph 1.1 in the Doctrinal Mastery Core Document. Invite the class to follow along. Explain that these two sentences contain two key statements of doctrine: There are three separate personages in the Godhead: God, the Eternal Father; His Son, Jesus Christ; and the Holy Ghost. The Father and the Son have tangible, glorified bodies of flesh and bone, and the Holy Ghost is a personage of spirit. Invite students to mark these key statements of doctrine in their copies of the Doctrinal Mastery Core Document. Why do you think these are important truths for people to understand? 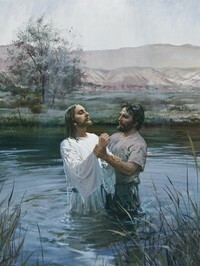 John the Baptist Baptizing Jesus (Matthew 3:13–17). At the Savior’s baptism, the Holy Ghost descended on the Savior like a dove and Heavenly Father spoke from heaven. 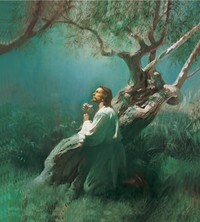 Jesus Praying in Gethsemane (Matthew 26:39, 42). Jesus prayed to Heavenly Father as He suffered in Gethsemane. Jesus Shows His Wounds (Luke 24:36–40). Jesus appeared to His Apostles with a resurrected body of flesh and bones. 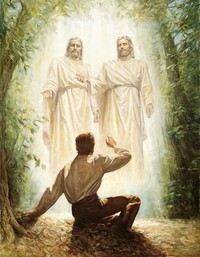 The First Vision (Joseph Smith—History 1:15–20). God the Father and His Son, Jesus Christ, appeared to Joseph Smith. Jesus Christ Appears to the Nephites (3 Nephi 11:3–11). Heavenly Father testified of His Beloved Son when Jesus Christ appeared to the Nephites in the land Bountiful. Ask students to review paragraph 1.1 in the Doctrinal Mastery Core Document. Invite them to locate the doctrinal mastery passage that helps teach the key statements of doctrine that they marked in this paragraph. Ask them to turn in their scriptures to Doctrine and Covenants 130:22–23, and invite them to consider marking this passage in a distinctive way so they will be able to locate it easily. To help students understand the context of this passage, explain that the Prophet Joseph Smith attended a stake conference where Elder Orson Hyde of the Quorum of the Twelve Apostles spoke. In his talk Elder Hyde included some ideas about the Godhead that were commonly taught but are false. After the meeting Joseph Smith offered to correct what Elder Hyde had taught. Elder Hyde gladly received this correction from the Prophet, and these corrections are now recorded in Doctrine and Covenants 130. Invite a student to read Doctrine and Covenants 130:22–23 aloud. Ask the class to follow along, looking for how this doctrinal mastery passage helps teach the key statements of doctrine. Invite students to report what they find. Following students’ comments, invite a student to read aloud the following statement from President Dallin H. Oaks of the First Presidency. Ask the class to listen for why it is important to know the truth about the Godhead. “… I testify that we have a Heavenly Father, who loves us. I testify that we have a Holy Ghost, who guides us. And I testify of Jesus Christ, our Savior, who makes it all possible” (Dallin H. Oaks, “The Godhead and the Plan of Salvation,” Ensign or Liahona, May 2017, 103). How do you think knowing the truth about the Godhead affects our relationship with the Father, the Son, and the Holy Ghost? What sources can we go to in order to learn the truth about the members of the Godhead? Invite a student to read the following statement by Elder Neil L. Andersen of the Quorum of the Twelve Apostles. Ask the class to listen for what he said about the Savior’s Second Coming. “The thought of His coming stirs my soul. It will be breathtaking! The scope and grandeur, the vastness and magnificence, will exceed anything mortal eyes have ever seen or experienced. “In that day He will not come ‘wrapped in swaddling clothes, lying in a manger’ [Luke 2:12], but He will appear ‘in the clouds of heaven, clothed with power and great glory; with all the holy angels’ [D&C 45:44]” (Neil L. Andersen, “Thy Kingdom Come,” Ensign or Liahona, May 2015, 122). Invite students to share what impresses them about the contrast between the Savior’s birth and His Second Coming. You might also invite students to turn to the hymn “Jesus, Once of Humble Birth” (Hymns, no. 196). You could sing this hymn as a class or have several students take turns reading the verses aloud. Invite the class to look for what the coming of Jesus Christ will be like and how it will be different from when He came as a baby born in Bethlehem. To help students understand the context of this passage, explain that shortly before a conference in 1830, the Prophet Joseph Smith received this revelation in the presence of six elders. 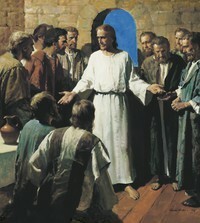 The revelation taught the group about the gathering of the Savior’s elect before His Second Coming. Ask a student to read aloud Doctrine and Covenants 29:10–11. Invite the class to follow along, looking for how this passage helps teach the key statement of doctrine they marked in paragraph 1.4. Ask students to report what they find. What does verse 11 teach us about the blessing the righteous will enjoy during the Millennium? 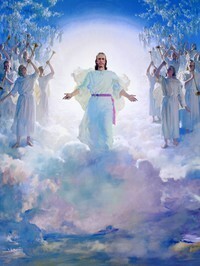 Testify that Jesus Christ will come again and He will live on earth with the righteous during a thousand years of peace. Note: The following review activities are not intended to be taught during the same class session as this lesson—“The Godhead, Part 1.” Please present these activities during seminary class sessions that take place after you have taught this lesson but before you teach “The Godhead, Part 2.” These short reviews can be taught at the beginning or end of classes in which you teach a regular sequential scripture lesson from the Doctrine and Covenants. Be sure that these reviews take no longer than five minutes, so as not to take away from the scripture block students will be studying in class. Divide students into groups of three or four. Provide each group with a copy of the following statement of doctrine that has been written on a piece of paper and cut into sections and mixed up: There are three / separate personages in / the Godhead: God, / the Eternal Father; / His Son, Jesus Christ; /and the Holy Ghost. / The Father and the Son / have tangible, glorified / bodies of flesh and bone / and the Holy Ghost is / a personage of spirit. Invite each group to put the sections of the statement of doctrine in the correct order. After all of the groups have put the statement in order, ask students to find the doctrinal mastery passage in the Doctrine and Covenants that teaches this doctrine. When the students have located Doctrine and Covenants 130:22–23, invite the class to read this passage aloud together. Ask students to explain why this passage and the statement of doctrine are important to understand. Write the following incomplete statement about Jesus Christ on the board: He will come again in ______ and ________ and will reign on the _______ during the __________. Ask students to find the doctrinal mastery passage in the Doctrine and Covenants that can help them complete this key statement of doctrine about Jesus Christ. Once the students have found Doctrine and Covenants 29:10–11, invite a student to read it aloud. Ask the class to follow along, looking for the words or concepts that can correctly complete the statement on the board. Invite a student to fill in the blanks on the board so that the doctrinal statement matches the following: He will come again in power and glory and will reign on the earth during the Millennium. Write the following doctrinal mastery passages on two separate pieces of paper, and place them at opposite ends of the classroom. Ask students to open their scriptures and quietly read and review each passage. After sufficient time, invite the students to close their scriptures. Read the following truths aloud, and ask students to point to the doctrinal mastery passage on the wall that contains that truth. Jesus Christ has a body of flesh and bones. Jesus Christ will reign on the earth during the Millennium. The Father and the Son have tangible, glorified bodies. There are three separate personages in the Godhead. Jesus Christ will come again in power and glory.